If you enter a village or villages in the Moluccas, one thing that immediately stands out is the one building looks different from most home residents. The building is typically larger, built with materials better, and decorated with more ornaments. Therefore, the building is usually at the same time is also the main markers (landmarks) village concerned, in addition to the mosque.It is the traditional house that serves as a place where sacred objects, ceremonial places, and where all citizens come together to discuss the problems they face. In Maluku, known as "Baileo", literally it means "hall". Baileo Maluku use the term "Baileo" as his name, because it is intended as a "hall with" indigenous peoples' organizations and local people to discuss various issues they face and seek solutions. Pamali Stone, a large stone where the offerings laid at the door of a building in Maluku is a sign that the building is the Hall of Indigenous Peoples. 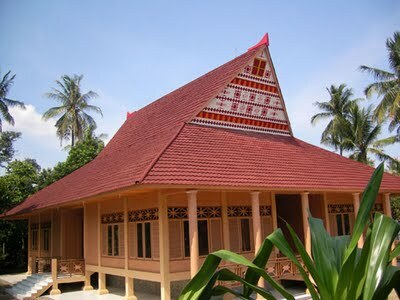 Baileu or Balai Adat which is the main Pavilion building. Nine pole on the front and rear, and five poles on the left and right is the symbol of Shiva Five, a symbol of alliance villages in the Moluccas which have existed for many centuries ago. In introducing the region display Bailem and home building or home Latu king. Acting as Head sreitek is customary throughout the Moluccas, and was built in 1974 and inaugurated its use on April 17, 1975. Building Bailem this is the only building that describes the cultural heritage Siwa-five, because that was chosen as a building that may represent areas of Maluku province. In addition to both traditional building, the pavilion is equipped with two Maluku heroine Martha Christina sculptures and statues of heroes Tiahahu Pattimura or Thomas Matulessy, depicting a garden pond Maluku sea, and the statue of processing sago. Building bailem as the original main building no walls and a house on stilts, the floor height above ground level. There is also bailem a cement floor on a rock and a floor bailen razed to the ground. Among the three kinds of bailen this is the most common and most typical is that the floor is built on pilings. The number of pillars symbolizing the number of clan-clan in the village. Bailen is no walls contain mean spirits of their ancestors freely in and out of the building. Medium floor is made of high bailen intended for the position of the dwelling ancestor spirits are higher than the standing of the people in the village. Besides the people will know that the deliberation took place from outside to inside and from bottom to top. In front bailen near the entrance and there beilen pamali that serves as the altar and pamali as a storage chamber or place of putting the goods on time use within considered sacred ceremony. Bailen form in Taman Mini Indonesia Indah is a form bailen the last or one that is melambngkan unity or alliance between two major clans in the Moluccas and Pata Pata Siwa Lima. This represents the amount at stake bailen on the front and rear of 9 in common with the students and the left and right side of 5 is equal to five. Final word mampunyai Siwa five new meaning is: We all have a symbol of unity and become the Moluccas. The function of Bailen is to place the people consulted and meetings with people like saniri country council, Council of Indigenous and others. So the democratic system has been known by the people since the first five-Siwa. Which may be stored in the form bailen objects that are considered sacred and there is a relationship with traditional ceremonies. In addition, there is one fruit or deliberation between the people and saniri neheri and traditional elders.